We are writing with urgent news. Recent reports have suggested the Trump Administration plans to eliminate J1 visa exchange programs which include intern and trainee visas sponsored by Communicating for Agriculture Exchange Programs (CAEP). “The Trump administration is considering major reductions in cultural exchange programs, including those for au pairs and summer workers, that allow young people from foreign countries to work in the U.S., people familiar with the administration’s planning said. President Donald Trump’s “Buy American and Hire American” executive order, issued in April, calls for a review of U.S. immigration rules to ensure that the interests of domestic workers are protected. No decisions have been made, but supporters of the program worry changes will be made without a full public debate,” according to The Wall Street Journal. For over 30 years, CAEP has connected the world through agriculture providing opportunities for young adults to learn about global agriculture, gain skills and knowledge in their fields of interest, improve English proficiency, learn about American culture in addition to sharing theirs, and build friendships with Americans and fellow trainees around the globe. Our vision at CAEP is to help both international students and Americans transcend from any political, geographical or ideological borders during an exchange program or hosting experience. CAEP believes exchange programs play a key role in public diplomacy and national security efforts. We see first hand the friendships made as this experience provides an opportunity to develop a more through and mutual between Americans and those from around the globe. In 2016, 75% of CAEP trainees and interns had a more positive perception of the United States upon completing their CAEP program and 69% of interns and trainees said they formed new international friendships during the course of their program. CAEP provides a practical learning experience for young adults interested in careers in agriculture, apiary, horticulture, enology, equine, and turf management. Many CAEP alumni are now operating their own farms, horticulture operations and wineries around the globe. Inevitably, the experiences and skills in which a participant gains during their time spent on a CAEP program opens the doors to many opportunities worldwide, helping prepare future leaders around the globe all while building positive relationships with Americans. Many participants learn valuable skills and knowledge in which they take home to apply in their own communities or villages helping allow the participant to become self-sufficient and economically stable. We at CAEP feel this is another invaluable tool for U.S. public diplomacy efforts as some participants come from impoverished and economically challenged countries. “Without J1 trainees and interns, we wouldn’t have enough helping hands on our crops farm in Minnesota,” according to CAEP host Allen Yaggie. “CAEP trainees and interns are dedicated and have an extensive interest in learning more about agricultural operations in America. We make it a priority to look for local help, but the low unemployment rate in our rural community presents a significant challenge. It has been an honor to host and teach interns and trainees on our farm for over 20 years as we have built life-long friendships with trainees and their families from all over the globe. CAEP provides a true international culture exchange to families and operations right here in rural America,” shared Yaggie. In 2015 -2016 academic year, J1 international students contributed $32.8 billion to the U.S. economy and supported over 400,000 jobs. Eliminating the J1 visa program would be a grave mistake­– negatively impacting local communities, employers, families, the economy, national security and public diplomacy efforts. 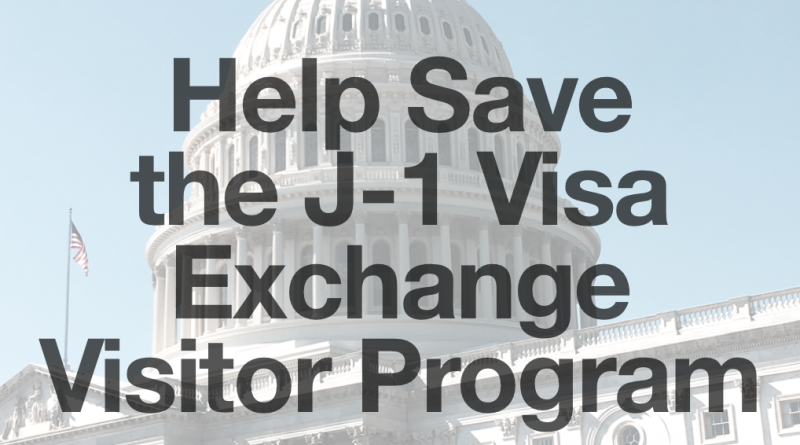 Please help us protect international exchange visitor programs from being terminated. 1. Write your U.S. Senators and Representatives by using this link. 2. Call the administration and voice your opposition to these cuts. Please join the coalition of stakeholders in this cause by joining Americans for Cultural Exchange. 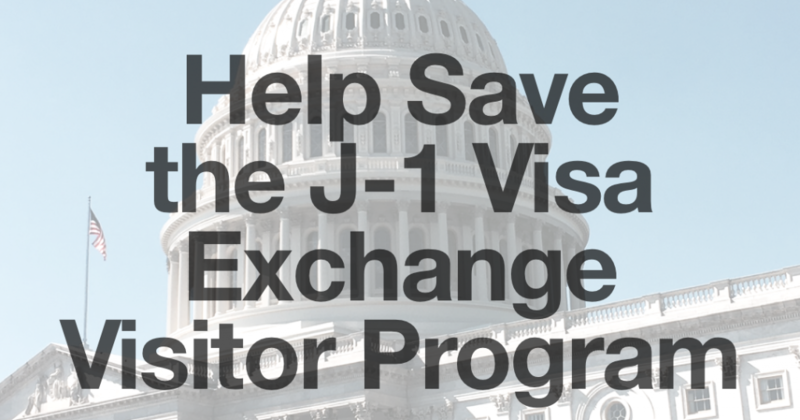 The Alliance is coordinating this coalition, which is made up of businesses, chambers of commerce, families, and others who advocate for strong and thriving international cultural exchange programs – especially those related to J1 visas.